Yuan dynasty banknotes are the earliest known fiat money. Fiat money is a currency established as money by government regulation or law. The term derives from the Latin fiat ("let it become", "it will become") used in the sense of an order or decree. It differs from commodity money and representative money. Commodity money is created from a good, often a precious metal such as gold or silver, which has uses other than as a medium of exchange (such a good is called a commodity), while representative money simply represents a claim on such a good. The first use of fiat money was recorded in China around 1000 AD. Since then, it has been used by various countries, concurrently with commodity currencies. While gold- or silver-backed representative money entails the legal requirement that the bank of issue redeem it in fixed weights of gold or silver, fiat money's value is unrelated to the value of any physical quantity. A coin is fiat currency to the extent that its face value, value defined in law, is greater than its market value as metal. In monetary economics, fiat money is an intrinsically valueless object or record that is widely accepted as a means of payment. In some micro-founded models of money, fiat money is created internally in a community making feasible trades that would not otherwise be possible, either because producers and consumers may not anonymously write IOUs, or because of physical constraints. Circulating silver coins in the 1960s ceased to be produced containing the precious metal when the face value of the coin was below the cost of the elemental metal. The Coinage Act of 1965 eliminated silver from the circulating dimes and quarter dollars of the United States, and most other countries did the same with their coins. The Canadian penny was mostly copper until 1996 and was removed from circulation in the fall 2012 due to the cost of production relative to face value. In 2007 the Royal Canadian Mint produced a million dollar gold bullion coin and sold five of them. In 2015, the gold in the coins was worth more than 3.5 times the face value. Fiat money originated in 11th century China, and its use became widespread during the Yuan and Ming dynasties. The Song Dynasty in China was the first to issue paper money, jiaozi, around the 10th century AD. Although the notes were valued at a certain exchange rate for gold, silver, or silk, conversion was never allowed in practice. The notes were initially to be redeemed after three years' service, to be replaced by new notes for a 3% service charge, but, as more of them were printed without notes being retired, inflation became evident. The government made several attempts to support the paper by demanding taxes partly in currency and making other laws, but the damage had been done, and the notes fell out of favor. 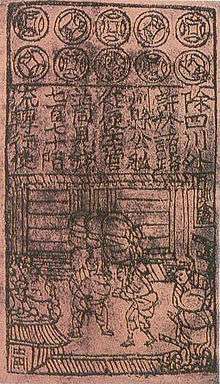 The successive Yuan Dynasty was the first dynasty in China to use paper currency as the predominant circulating medium. The founder of the Yuan Dynasty, Kublai Khan, issued paper money known as Chao in his reign. The original notes during the Yuan Dynasty were restricted in area and duration as in the Song Dynasty. During the 13th century, Marco Polo described the fiat money of the Yuan Dynasty in his book The Travels of Marco Polo. All these pieces of paper are issued with as much solemnity and authority as if they were of pure gold or silver... and indeed everybody takes them readily, for wheresoever a person may go throughout the Great Kaan's dominions he shall find these pieces of paper current, and shall be able to transact all sales and purchases of goods by means of them just as well as if they were coins of pure gold. Tally sticks were employed as fiat currency in medieval England when, due to gold shortage, Henry I initiated their use by the Exchequer in or around 1100; royal taxes had to be paid in tally sticks. Washington Irving records an emergency use of paper money by the Spanish in a siege during the Conquest of Granada (1482-1492). In 1661, Johan Palmstruch issued the first regular paper money in the West, under royal charter from the Kingdom of Sweden, through a new institution, the Bank of Stockholm. While this private paper currency was largely a failure, the Swedish parliament eventually took over the issue of paper money in that country. By 1745, its paper money was inconvertible to specie, but acceptance was mandated by the government. This fiat currency depreciated so rapidly that by 1776 it returned to a silver standard. Fiat money also has other roots in 17th-century Europe, having been introduced by the Bank of Amsterdam in 1683. In 17th century New France, now part of Canada, the universally accepted medium of exchange was the beaver pelt. As the colony expanded, coins from France came to be widely used, but there was usually a shortage of French coins. In 1685, the colonial authorities in New France found themselves seriously short of money. A military expedition against the Iroquois had gone badly and tax revenues were down, reducing government money reserves. Typically, when short of funds, the government would simply delay paying merchants for purchases, but it was not safe to delay the payment of soldiers due to the risk of mutiny. Jacques de Meulles, the Intendant of Finance, came up with an ingenious ad-hoc solution — the temporary issuance of paper money to pay the soldiers, in the form of playing cards. He confiscated all the playing cards in the colony, cut them up into pieces, wrote denominations on the pieces, signed them, and issued them to the soldiers as pay in lieu of gold and silver. Because of the chronic shortages of money of all types in the colonies, these cards were readily accepted by merchants and the public and circulated freely at face value. It was intended to be purely a temporary expedient, and it was not until years later that its role as a medium of exchange was recognized. The first issue of playing card money occurred in June 1685 and was redeemed three months later. However, the shortages of coinage reoccurred and more issues of card money were made in subsequent years. Because of their wide acceptance as money and the general shortage of money in the colony, many of the playing cards were not redeemed but continued to circulate, acting as a useful substitute for scarce gold and silver coins from France. Eventually, the Governor of New France acknowledged their useful role as a circulating medium of exchange. As the finances of the French government deteriorated because of European wars, it reduced its financial support for its colonies, so the colonial authorities in Canada relied more and more on card money. By 1757, the government had discontinued all payments in coin and payments were made in paper instead. In an application of Gresham’s Law — bad money drives out good — people hoarded gold and silver, and used paper money instead. The costs of the war with the British led to rapid inflation in New France. Following the British conquest in 1760, the paper money became almost worthless, but business did not come to a halt because gold and silver that had been hoarded came back into circulation. Under the Treaty of Paris (1763), the French government agreed to convert the outstanding card money into debentures, but with the French government essentially bankrupt, these bonds fell into default and by 1771 they were worthless. The Royal Canadian Mint still issues Playing Card Money in commemoration of its history, but now in 92.5% silver form with gold plate on the edge. It therefore has an intrinsic value which considerably exceeds its fiat value. The Bank of Canada and Canadian economists often use this early form of paper currency to illustrate the true nature of money for Canadians. An early form of fiat currency in the American Colonies were "bills of credit." Provincial governments produced notes which were fiat currency, with the promise to allow holders to pay taxes in those notes. The notes were issued to pay current obligations and could be called by levying taxes at a later time. Since the notes were denominated in the local unit of account, they were circulated from person to person in non-tax transactions. These types of notes were issued particularly in Pennsylvania, Virginia and Massachusetts. Such money was sold at a discount of silver, which the government would then spend, and would expire at a fixed point in time later. Bills of credit have generated some controversy from their inception. Those who have wanted to highlight the dangers of inflation have focused on the colonies where the bills of credit depreciated most dramatically – New England and the Carolinas. Those who have wanted to defend the use of bills of credit in the colonies have focused on the middle colonies, where inflation was practically nonexistent. Colonial powers consciously introduced fiat currencies backed by taxes, e.g. hut taxes or poll taxes, to mobilise economic resources in their new possessions, at least as a transitional arrangement. The purpose of such taxes was later served by property tax. The repeated cycle of deflationary hard money, followed by inflationary paper money continued through much of the 18th and 19th centuries. Often nations would have dual currencies, with paper trading at some discount to specie backed money. Examples include the “Continental” issued by the U.S. Congress before the Constitution; paper versus gold ducats in Napoleonic era Vienna, where paper often traded at 100:1 against gold; the South Sea Bubble, which produced bank notes not backed by sufficient reserves; and the Mississippi Company scheme of John Law. During the American Civil War, the Federal Government issued United States Notes, a form of paper fiat currency popularly known as 'greenbacks'. Their issue was limited by Congress just slightly over $340 million. During the 1870s, withdrawal of the notes from circulation was opposed by the United States Greenback Party. The term 'fiat money' was used in the resolutions of an 1878 party convention. After World War I, governments and banks generally still promised to convert notes and coins into their underlying nominal commodity (redemption in specie) on demand. However, the costs of the war and the required repairs and economic growth based on government borrowing afterward made governments suspend redemption in specie. Some governments were careful of avoiding sovereign default but not wary of the consequences of paying debts by consigning newly printed cash which had no metal-backed standard to their creditors, which led to hyperinflation – for example the hyperinflation in the Weimar Republic. From 1944 to 1971, the Bretton Woods agreement fixed the value of 35 United States dollars to one troy ounce of gold. Other currencies were pegged to the U.S. dollar at fixed rates. The U.S. promised to redeem dollars in gold to other central banks. Trade imbalances were corrected by gold reserve exchanges or by loans from the International Monetary Fund. The Bretton Woods system collapsed in what became known as the Nixon Shock. This was a series of economic measures taken by United States President Richard Nixon in 1971, including unilaterally canceling the direct convertibility of the United States dollar to gold. Since then, a system of national fiat monies has been used globally, with freely floating exchange rates between the major currencies. A central bank introduces new money into the economy by purchasing financial assets or lending money to financial institutions. Commercial banks then multiply this base money by credit creation through fractional reserve banking, which expands the total supply of broad money (cash plus demand deposits). In modern economies, relatively little of the supply of broad money is in physical currency. For example, in December 2010 in the U.S., of the $8,853.4 billion in broad money supply (M2), only $915.7 billion (about 10%) consisted of physical coins and paper money. The manufacturing of new physical money is usually the responsibility of the central bank, or sometimes, the government's treasury. The adoption of fiat currency by many countries, from the 18th century onwards, made much larger variations in the supply of money possible. Since then, huge increases in the supply of paper money have taken place in a number of countries, producing hyperinflations – episodes of extreme inflation rates much higher than those observed in earlier periods of commodity money. The hyperinflation in the Weimar Republic of Germany is a notable example. Economists generally believe that high rates of inflation and hyperinflation are caused by an excessive growth of the money supply. Today, most economists favor a low and steady rate of inflation. Low (as opposed to zero or negative) inflation reduces the severity of economic recessions by enabling the labor market to adjust more quickly in a downturn, and reduces the risk that a liquidity trap prevents monetary policy from stabilizing the economy. However, money supply growth does not always cause nominal price increases. Money supply growth may instead lead to stable prices at a time in which they would otherwise be falling. Some economists maintain that under the conditions of a liquidity trap, large monetary injections are like "pushing on a string." The task of keeping the rate of inflation low and stable is usually given to monetary authorities. Generally, these monetary authorities are the central banks that control monetary policy through the setting of interest rates, through open market operations, and through the setting of banking reserve requirements. A fiat-money currency greatly loses its value should the issuing government or central bank either lose the ability to, or refuse to, further guarantee its value. The usual consequence is hyperinflation. Some examples where this has occurred are the Zimbabwean dollar, China in 1945 and the Mark in the Weimar Republic in 1923. But this need not necessarily occur; for example, the so-called Swiss dinar continued to retain value in Kurdish Iraq even after its legal tender status was withdrawn by the Iraqi central government which issued the notes. ↑ Fiat is the third-person singular present active subjunctive of fiō ("I become", "I am made"). 1 2 3 Walsh, Carl E. (2003). Monetary Theory and Policy. The MIT Press. ISBN 978-0-262-23231-9. ↑ See Monetary economics for further discussion. ↑ John Maynard Keynes (1965) . "1. The Classification of Money". A Treatise on Money. 1. Macmillan & Co Ltd. p. 7. Fiat Money is Representative (or token) Money (i.e something the intrinsic value of the material substance of which is divorced from its monetary face value) – now generally made of paper except in the case of small denominations — which is created and issued by the State, but is not convertible by law into anything other than itself, and has no fixed value in terms of an objective standard. ↑ Kiyotaki, Nobuhiro & Wright, Randall (1989). "On Money as a Medium of Exchange". Journal of Political Economy. 97 (4): 927–954. doi:10.1086/261634. .
↑ Lagos, Ricardo & Wright, Randall (2005). "A Unified Framework for Monetary Theory and Policy Analysis". Journal of Political Economy. 113 (3): 463–484. doi:10.1086/429804. .
↑ "Eliminating the penny from Canada's coinage system" Canada Revenue Agency. ↑ "The Million Dollar Coin – a true milestone in minting"
↑ Selgin, George (2003), "Adaptive Learning and the Transition to Fiat Money", The Economic Journal, 113 (484): 147–65, doi:10.1111/1468-0297.00094 . ↑ Von Glahn, Richard (1996), Fountain of Fortune: Money and Monetary Policy in China, 1000–1700, Berkeley: University of California Press . ↑ Ramsden, Dave (2004). "A Very Short History of Chinese Paper Money". James J. Puplava Financial Sense. ↑ David Miles; Andrew Scott (January 14, 2005). Macroeconomics: Understanding the Wealth of Nations. John Wiley & Sons. p. 273. ISBN 978-0-470-01243-7. ↑ Marco Polo (1818). The Travels of Marco Polo, a Venetian, in the Thirteenth Century: Being a Description, by that Early Traveller, of Remarkable Places and Things, in the Eastern Parts of the World. pp. 353–355. Retrieved September 19, 2012. ↑ Foster, Ralph T. (2010). Fiat Paper Money – The History and Evolution of Our Currency. Berkeley, California: Foster Publishing. pp. 59–60. ISBN 978-0-9643066-1-5. 1 2 Bank of Canada (2010). "New France (ca. 1600-1770)" (PDF). A History of the Canadian Dollar. Bank of Canada. Retrieved February 12, 2014. ↑ "Playing Card Money Set". Royal Canadian Mint. 2014. Retrieved July 6, 2016. 1 2 3 4 5 Michener, Ron (2003). "Money in the American Colonies." EH.Net Encyclopedia, edited by Robert Whaples. ↑ "Fiat Money". Chicago Daily Tribune. May 24, 1878. ↑ ""Bretton Woods" Federal Research Division Country Studies (Austria)". Library of Congress. ↑ Robert Barro and Vittorio Grilli (1994), European Macroeconomics, Ch. 8, p. 139, Fig. 8.1. Macmillan, ISBN 0-333-57764-7. ↑ John Makin (November 2010). "Bernanke Battles U.S. Deflation Threat" (PDF). AEI. ↑ Paul Krugman; Gauti Eggertsson. "Debt,Deleveraging, and the liquidity trap: A Fisher‐Minsky‐Koo approach" (PDF). ↑ Taylor, Timothy (2008). Principles of Economics. Freeload Press. ISBN 1-930789-05-X. ↑ Foote, Christopher; Block, William; Crane, Keith & Gray, Simon (2004). "Economic Policy and Prospects in Iraq". The Journal of Economic Perspectives. 18 (3): 47–70. doi:10.1257/0895330042162395. .
↑ Budget and Finance (2003). "Iraq Currency Exchange". The Coalition Provisional Authority. Archived from the original on May 15, 2007.